So… here are some pics of the progress I have made (definitely have to celebrate the small steps). Lots of fun tiny triangles! I still have to add the other black triangles to the HSTs, but I will hopefully have a chance to cut and sew them over this next week. These are just too cool. I wasn’t sure at first about the string piecing – but RRCB got me going and now I look forward to projects that have this technique. Obviously, I have a few of my blue string blocks made, a few to trim, and several more to actually sew together. No, they aren't for weaving! But at least I got organized! I have red strips and blue strips cut and ready to use. I don’t know if you can really see it, but in the red basket I have my phone book paper and the Companion Angle ruler. I had to laugh because when I got to the Red Block step I was trying to find an easy way to trim the blocks. I just about broke down and ordered the ruler thinking that I would have to save the last part of the step (trimming the triangles) for later. Then, I was organizing some other containers with projects and I found (drumroll please) a Companion Angle ruler! I didn’t even know that I had one and now I can’t wait to dig into the reds and try it out for the first time. So pretty, oh so pretty! And since I’m celebrating the small things – look at all this pretty fabric. I love the color choices and can’t wait to see what it will be like all put together. 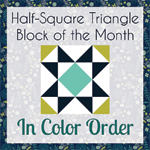 If you are interested in seeing other quilters’ progress on this mystery, check out the linkup on Quiltville! thank you for posting your progress to date…and congratulations on finding the ruler. Almost enough to make me organize a bin just to see what I might find too!! Your colours are great. LOVE LOVE LOVE, the pic of how neat your stash is for you to go “shopping” for this Quilt. Actually love how you have it all in all your containers. Keep up the great work.!! Congrats on celebrating the small victories! I have so much going on, that I have committed to myself only to making sure I do a sample from each step so that I am familiar with it when I get back to it. I have just finished sewing the blocks from Step 1 together, they aren’t even pressed. Funny about finding the ruler – the same thing happened to me last year when I first discovered Bonnie’s site and I just “had” to have those rulers. I’m glad I cleaned up my room before I went shopping, too! Keep going, it will turn out lovely.